Australian author, Charles Massy, will provide an exclusive session for the Savory Champions and Savory Global Network on January 10, 2018. Register for the Savory Champions program to join us. Charles Massy gained a BSc (Zoology, Human Ecology) at ANU (1976), before going farming and developing a prominent Merino sheep stud business. His concern about land degradation and humanity’s sustainability challenge led to him completing a PhD in Human Ecology (ANU) in 2012. He has chaired and served as a Director on a number of national and international review panels and boards of business, research organizations and statutory wool bodies, involving garment manufacture, wool marketing, R&D, molecular genetics and genomics. Charles has engaged in freelance journalism since 1977, widely publishing across a range of subjects including mountaineering, history, ecology and the environment, plus fiction and poetry. His first two books told the history of the Australian Merino and his third book, Breaking the Sheep’s Back (2011), recounted the political destruction of the Australian wool industry. The latter was short listed in 2012 for the Prime Minister’s Literary Award for Australian History and for the Ashurst Business Literature Prize. He also contributed a chapter to the ground-breaking anthology Fair Food (2015). His new book, Call of the Reed Warbler: A New Agriculture – A New Earth (UQP Sept. 2017) concerns the emergence of a regenerative agriculture in Australia and its positive implications for both addressing humanity’s emerging Anthropocene crisis and also for human health (physical and mental). 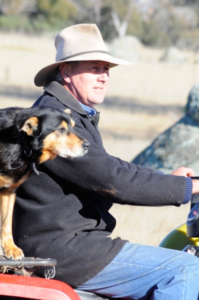 Charles still manages the family’s grazing property in NSW while teaching at universities and consulting widely in the fields of Merino breeding, landscape design, and transformative change in agriculture. To join the Savory Champions program, please sign up here. Use discount code CHAMPIONMASSY18 to get a 10 percent discount when registering now until December 31, 2017.